Our popular service kits are an economical way to keep your Guzzler pumping long into the future. 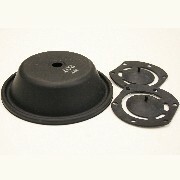 Each service kit includes a replacement diaphragm and a pair of inlet/outlet valves. Available for any size Guzzler pump.